Atmel Studio 7.0 build 582 was installed from the offline installer file as-installer-7.0.582-full.exe (SHA-1: 42b600943a6ab524e61f5163b97a20f8a742c7f4) when the C Programming with Arduino book was written. As with any software, Atmel Studio is periodically updated to fix bugs, add new features and support new microcontrollers. If a newer version of Atmel Studio is installed, there may be differences in appearance between Atmel Studio and the images of Atmel Studio in the book. Differences are usually minor, and following the book with the latest version of Atmel Studio should not be a problem. If you would like to ensure exact compatibility between the book and Atmel Studio, it is suggested to install the above version of Atmel Studio that can be found on the Atmel Studio archive page on the Atmel website, where all previous versions of Atmel Studio can be found. Following are some problems experienced when using newer versions of Atmel Studio with solutions to the problems. The following problems were found in Atmel Studio 7.0, build 790. Atmel Studio now has an Advanced and Standard mode. When Atmel Studio is put into Advanced mode, the toolbars shown in images in the book will be visible in Atmel Studio. To change between Advanced and Standard mode, click the text at the very top of the Atmel Studio window which will either be Standard Mode or Advanced Mode, depending on the current mode that Atmel Studio is in or select Tools → Select Profile from the top menu. A dialog box will pop up allowing the mode to be changed. After clicking the desired mode in the dialog box, click the Apply button. 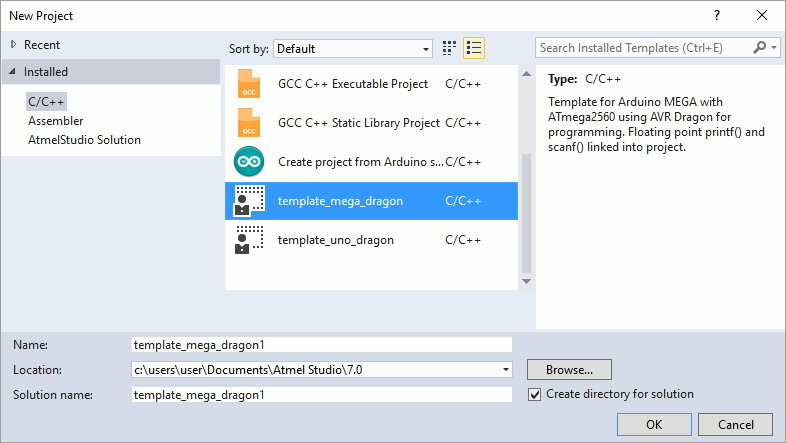 Changing to Advanced mode in Atmel Studio leads to another problem in that when a new project is created, the template files used with the book are not found in the New Project dialog box. This problem and solution is described under the next heading below. When Atmel Studio is in Advanced mode, the template files installed in section 1.3 on page 26 of the book do not appear in the New Project dialog box. The solution is to put Atmel Studio into Standard mode when creating a new project and then to change back to Advanced mode if needed. To get the template files to appear in the New Project dialog box when Atmel Studio is in Standard mode, copy the template files to Documents → Atmel Studio → 7.0 → Templates → ProjectTemplates as described in the book.